Hi there—It’s Kate, owner of Sky Trading Co. with my next edition of Sky’s the Limit: a blog of Q&A-style interviews featuring the shakers, makers and mostly badass women around Columbus, OH. Hopefully, their stories will inspire you to live fearlessly. Enjoy! For those that don’t know, can you describe what you do at Sarah Harste Weavings? It’s two parts—it’s a product-based and an education-based business. I sell weavings, macramé, and weaving tools. I teach workshops in the Midwest, including cities around Ohio, Pittsburgh and Indianapolis. I try to get people excited about working with fiber. 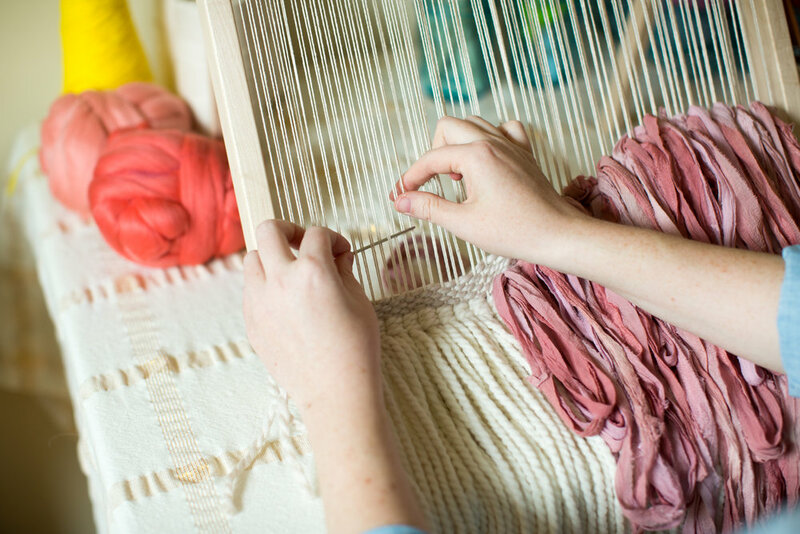 What got you into weaving? 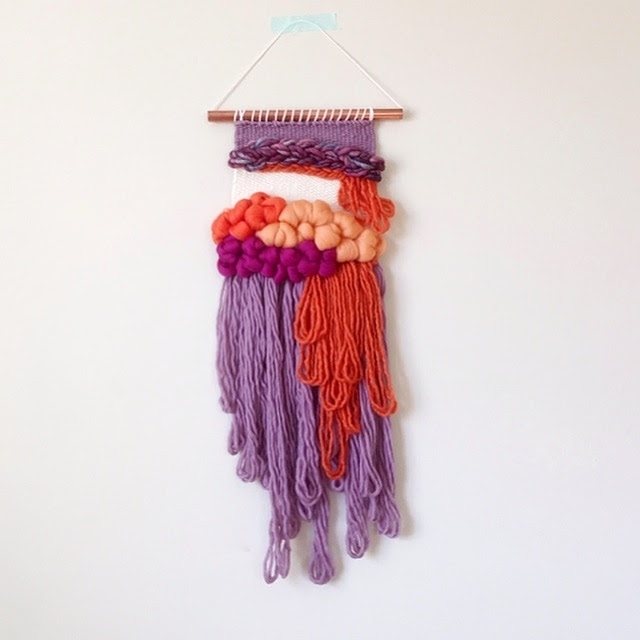 I began to see fiber art on Instagram about three years ago and I was immediately drawn to it. I needed to know more about it and learn how to weave. I bought a loom online, and on a snowy February day I sat in my bed for six hours and I taught myself to weave. It was magical and I felt like time was slipping away. I became obsessed. What was the first step you took when you decided you wanted to start selling your art? My first step was setting up an Etsy shop combined with getting comfortable sharing my work on Instagram. The first thing you have to learn is how to become a self-promoter and that can be really hard especially if you’re not used to putting yourself out there and promoting your own work. In the beginning How did you fund your business? It was a little bit at a time. I funded it from my own personal money I was making from my job. The first time I taught a workshop was the first time I had a big chunk of money come in all at once, which is the first time I realized I was going to start investing in my business. I bought a lot of wood and power tools to start making looms. I opened up a bank account and got my logistics in order and started treating it as a business instead of a hobby. Did you ever have any doubt that this wasn’t what you were supposed to do? What did you do to keep those thoughts at bay? Like, every single day! To doubt yourself is a very natural thought process. I think that it’s hard to wake up every day and feel completely committed to what you are doing and feel like you are on the right path. I talk to my support system including my fiancé and friends. When you can voice your doubts out loud, it makes them less scary, gives them less power and makes it feel more like a passing thought versus reality. It’s hard to believe in the power of what you can do, but that’s one of the coolest things about running your own business—you put faith in yourself. Mostly Instagram and word of mouth. I’m extremely fortunate because the people who take my workshops tell their friends about it. There’s power in giving people a great experience. What’s your favorite social media platform and why? Do you have any social media tips? Definitely Instagram. Think of Instagram as a platform for connection versus a platform for promotion. Try to engage others – you may even make friends with other people. I love posting my friend’s work to give them some love and I think people connect with that. 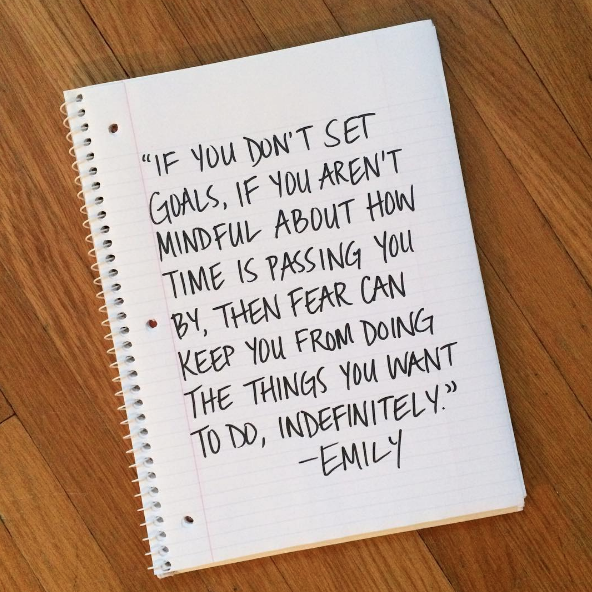 What were your biggest fears when starting your business? How did you keep those fears at bay? When I was first starting, I was scared people wouldn’t respond to my work. When I started doing workshops, I was scared people would have a bad experience. When I went full-time, I wondered if I would fail or be able to pay my bills. I also wondered how it would feel if I had to go back to work. Putting yourself in a vulnerable state is scary. To combat those fears, I tell myself I can only do the best I can. I think…if I did fail and have to go back to work, would that really be the worst thing in the world? Of course, not. I’d still have my fiancé, my family, my friends. What’s your favorite part about owning your own business? However hard I work, I get to see the results. There’s no middle man or bureaucracy of getting approvals. Whatever experiment I want to try, I can do it. It’s always my call. 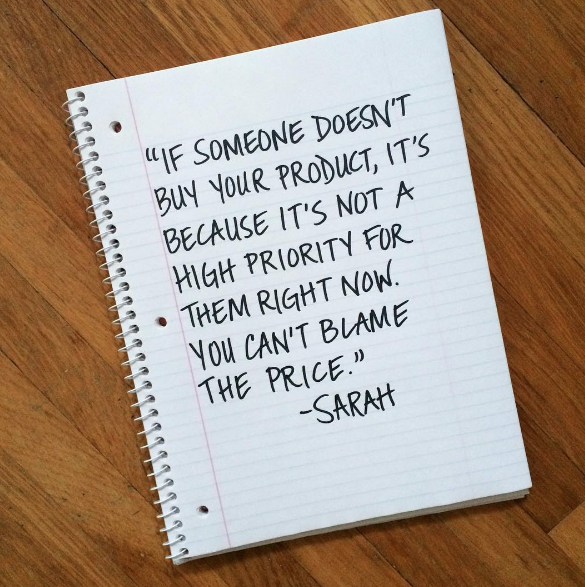 It’s hard to separate what’s personal and your business. I have my own insecurities that can bleed into my business and that can be hard to untangle. What advice would you give to young entrepreneurs who want to follow their dreams and start their own company? Take your business seriously and not seriously, meaning your business can turn into something full-time, it can be successful and it can become a huge part of your life, but don’t take it so seriously that making big decisions is so crippling that it hinders your ability to get started. You are going to fail a million times which is part of starting your own business. The quicker you get comfortable with the idea of failure, the quicker you’ll probably get to success. Speaking of success, what do you think has been your biggest success to-date? It was really cool to be featured in 614 Magazine this year. 934 Gallery also asked me to be a part of a fiber art show, which was a great moment because I have a hard time considering myself an artist versus a crafter, and it changed the way I thought about myself and my work. I felt like it was permission to take myself seriously and see myself as an artist. Let’s talk about your Podcast! When did it start andWhat is it? Why did you start it? It started this past summer. I do it with my friend Emily Mullen of Written Paper Goods and it’s called Scrap Paper. It’s a real conversation about the experiments we do in business. Our approach isn’t to give people advice; rather people get to listen in on a conversation where we figure out different topics in business together. I think our listeners are in the beginning stages of business. I think they want a dose of real talk. It’s unpolished and acknowledges that starting a business is hard and you don’t always know what to do—you have to try things and it’s a feeling of camaraderie that we’re with them. Our listeners can learn from our mistakes and from things that have worked for us. It’s nice because people can get advice from the podcast and feel like they are a part of a community, like we’re friends having a chat. Do you have any advice for people who want to start podcasting? Just start and you’ll figure it out. Unless you hire a sound engineer it’s impossible that your first podcast will sound perfect. Set your ideals and do the work where your podcast sounds like a branded experience. For example, have a theme song that plays at the beginning of each episode. What do you want people to know about next? The holiday season is coming up and I’m so excited about releasing macramé kits (coming November 15). I’m excited about doing a lot of markets in November and December, sharing my work and meeting new people. Also, we just wrapped up the first season of my podcast, and I’m really proud of that! Be sure to check out Sarah’s store here, listen to her podcast here and follow her on Instagram here! Also, let me know if there is anything you are curious about or think I should ask during my next interview in the comments below!